A mounter's mark (not in Lugt). 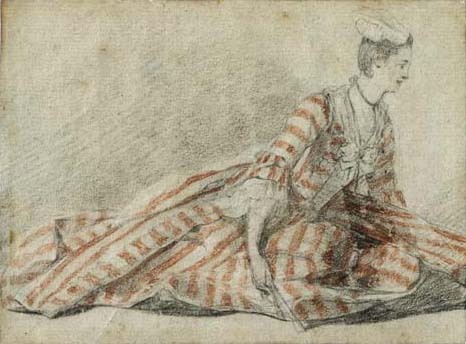 The pose of the figure and the technique, combining black lead and red chalk, are reminiscent of the art of Watteau and particularly that of a sheet in the British Museum showing a reclining woman seen from behind wearing a similar striped dress, P. Rosenberg and L.-A. Prat, Antoine Watteau (1684-1721), Catalogue raisonné des dessins, Milan, 1996, II, no. 467. The drawing was engraved by Boucher in the Figures de différents caractères, no. 161 and would have been familiar to Ollivier.